The 3am Teacher: Happy Mother's Day Everyone! The other day, I spotted a beautiful butterfly while out walking in my neighborhood. 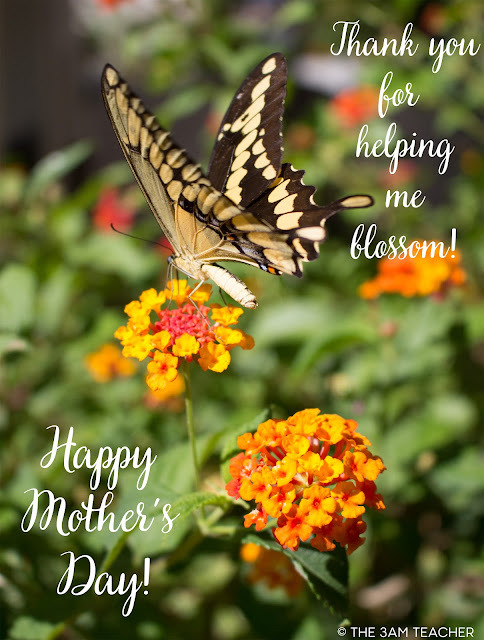 It's not easy getting a nice picture of a wild butterfly in open spaces, but I got really lucky getting this picture and decided it was the perfect photo for a Mother's Day note for all of you... Feel free to use the images below to send a nice Mother's Day note on any of your social media accounts. I hope you all have a beautiful day and you all have someone to tell you how important and beautiful you are!! That's a beautiful picture! Those flowers are called Lantana, and I love the bright colors. I guess that butterfly does too. I just planted some of these yesterday. I hop they attract butterflies to my garden. Happy Mother's Day to you. If your day is as bright as this picture, then my wish for you would come true!